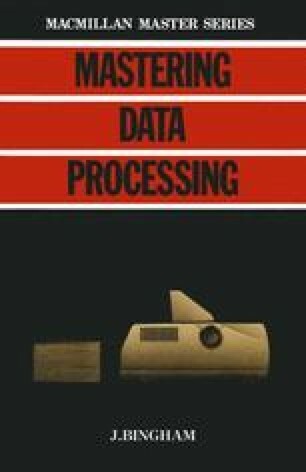 We have seen in Chapter 1 that data is the raw material from which information is produced and this alone gives it a major role in any organisation. Historically, data has tended to be collected, prepared and used to produce only one or at best a small range of information outputs. Thus, if the payroll department needed personnel and attendance data they arranged for it to be collected, very often in parallel with procedures for the collection of the same (or closely similar data) for the personnel and cost accounts departments. This attitude has tended to be perpetuated in computer data processing with each development project leading to the collection, preparation and storage of data specifically for the application. This approach is inherently wasteful. Not only are there the direct costs associated with the collection and storage of basically the same data, but there are also the indirect costs involved in reconciling information derived from different sources. Even more importantly, this approach to data management makes it difficult to extract information from the data in ways other than that envisaged when it was collected.